Simon's Rock professor Brendan Mathews celebrates the publication of his short story collection This Is Not a Love Song with a reading at Alumni Library. When marriages, friendships, and families come undone, how far will we go to keep it all together? That question lies at the heart of Brendan Mathews's buoyant and unforgettable debut story collection. A young mother watches as her desperate husband, convinced a hidden poison lurks inside their walls, tears their home apart. Two journalists bruised by romance and revolution trade tales of lost lovers. A father and his sons haggle over the family business during a high-stakes round of golf. And a lovesick circus clown tries to explain the accidents that bound him to a trapeze artist and a witless lion tamer. 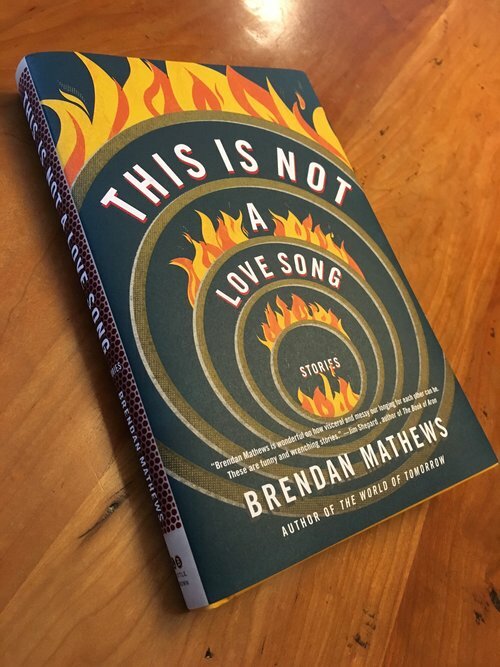 Brendan Mathews is the author of This Is Not a Love Song and The World of Tomorrow (Little, Brown & Co.), which was longlisted for the Center for Fiction First Novel Prize and named an Editors' Choice by the New York Times Book Review. A Fulbright Scholar to Ireland, his fiction has twice appeared in The Best American Short Stories and in Glimmer Train, Virginia Quarterly Review, Salon, Cincinnati Review, and other publications in the US and UK. He has been the recipient of grants and fellowships from the Massachusetts Cultural Council, Sustainable Arts Foundation, and the Sewanee Writers Conference. He graduated from the University of North Carolina at Chapel Hill and received his MFA from the University of Virginia. He teaches literature and creative writing at Bard College at Simon’s Rock. This event is free and open to the public. Copies of This Is Not a Love Song will be available for purchase.